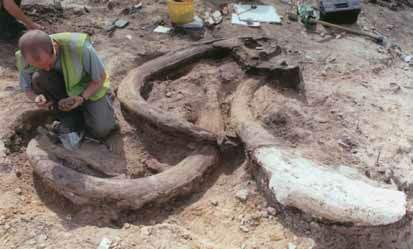 In spring 2002 mammoth bones and associated Mousterian stone tools were found in situ at Lynford Quarry, near Munford village, Norfolk, UK. The finds were within the organic sediments of a palaeochannel. Excavation was undertaken with support from Ayton Asphalte, the quarry owners, and English Heritage, funded through the Aggregates Levy Sustainability Fund (ASLF). These finds are a rare example of British Middle Palaeolithic tools, associated with the Neanderthal occupation of what was then a peninsula of north-west Europe. The excavation recovered exceptionally well-preserved archaeological and palaeoenvironmental information. The association of woolly mammoth bones with bout- coupé handaxes (bifaces) and this wealth of palaeoenvironmental data provided a unique opportunity to investigate questions of diet, land use and habitat from deposits within a small geological feature. The palaeoenvironmental evidence and optically stimulated luminescence (OSL) dating show that the site was occupied c 65-57ka, at the transition between Marine Isotope Stages (MIS) 4 and 3. The plant and invertebrate remains indicate open conditions dominated by grasses, sedges and low-growing herbaceous communities, with small stands of birch or scrub, and areas of acid heath or bog, and a mild climate. Finds included 1,365 identified bones, of which 91 per cent are woolly mammoth; and 2,720 lithic pieces, including 41 complete and 6 broken handaxes, and 20 flake tools. In addition, an associated sandstone block bears use traces made by a softer material, possibly wood, and was possibly used as a fire striker. The Lynford finds give a rare opportunity to study the socioecology of Neanderthals and the relationship between their social structure and the distribution of resources in the landscape during the last cold stage of Ice Age Europe.